The fly orchid, Ophrys insectifera, is an orchid growing in wet meadows in lime stone areas. There is no coincidence that the flowers resemble insects. They imitate the female of certain insects, the digger wasps. The scent of the flowers imitates that of a female digger wasp ready for mating. 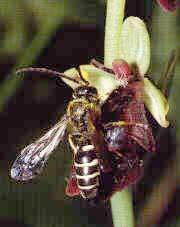 When the orchid is flowering the digger wasp males are fooled to try to mate with the flowers. The pollen that sticks to the insect's body can pollinate another plant of the same species, when the insect makes the same mistake again. Fly orchid is a dishonest orchid since it fools the insects to visit them without offering a reward. It is believed that about a third of the world's 25 000 different orchid species are dishonest.